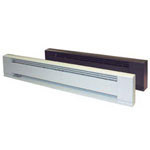 Available in white or brown with stainless steel heating element and aluminum fins. Powder coated 12 gauge heavy duty extruded Aluminum housing construction with junction boxes located on each end of the unit. Special colors available, consult factory.